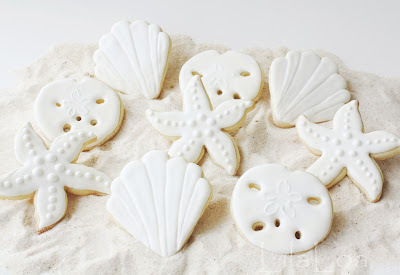 After I posted my seashell cookies yesterday, I took a quick trip around the internet and saw that about a gajillion other people are making seashell cookies this week. Isn't that great?! I'm totally part of a "fad!" (Or is it a "trend?" Is there a difference?) Anyway...as promised...here is a bit more about how I made them. The starfish cookies were probably the easiest. I took a 5 petal flower cutter and pulled the petals out a bit and pinched the ends so they curved sideways. 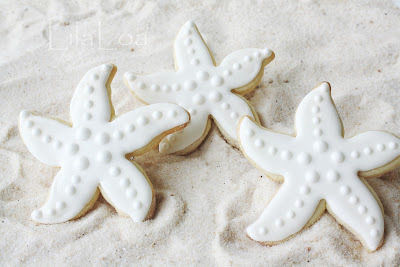 And then after I had baked them all...I realized a star cutter would have been much simpler. I iced the background and let them dry for a couple of hours. 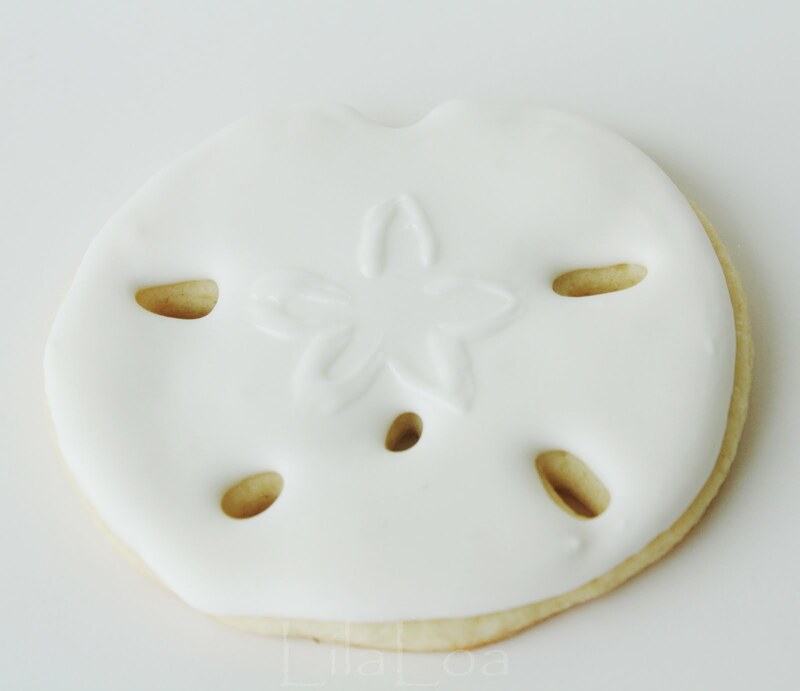 Then I used some thicker icing and piped big dots in the middle and slightly smaller dots radiating outwards. Done. I actually made the cutter for these cookies. I know they sell a clamshell cutter, but I don't like the bottom part of it. Although, I'm fairly sure you could just cut that part off. But, I think that you could make a similar cookie by cutting out a square cookie and then cutting off two of the edges with a scalloped cutter. 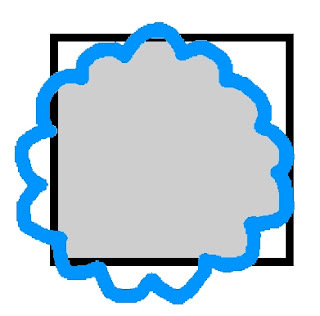 (Let's not judge my incredibly skilled paint job, okay?) Or you could use the candy corn cutter from Halloween with a scalloped circle. 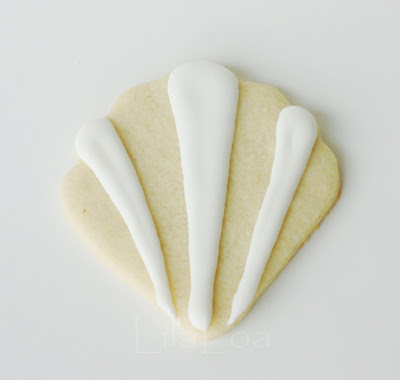 Or...you could take that candy corn cutter, and just make indents with a toothpick for the scalloped parts. If there is something that works for you...you should probably just do that. I did this first. I probably shouldn't be blogging today. I can't even think of words to describe this. Umm, I piped half of the pointy-fan-shaped-rib-type-things first. 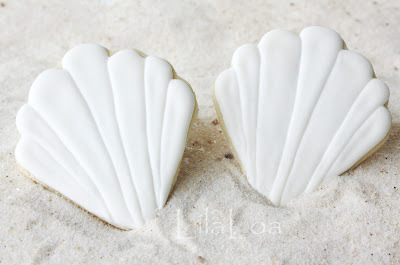 I let them dry for about 30 minutes and filled in the rest of the shell. These would have been THE perfect use for my flimsy metal circle cutters that can't cut a true circle to save their lives. But I couldn't find those cutters. Because I had placed them right next to my rolling pin. (Apparently, being "organized" or "neat" really IS over rated.) So I used my sturdy circle cutter and just stretched them and bent them a little to make them look a little more real. 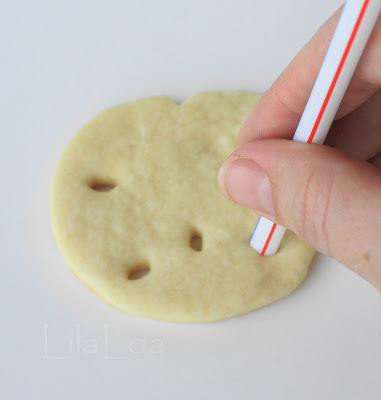 And then I bent the end of a drinking straw so that it was oval shaped and cut out all the little holes in the sand dollar. 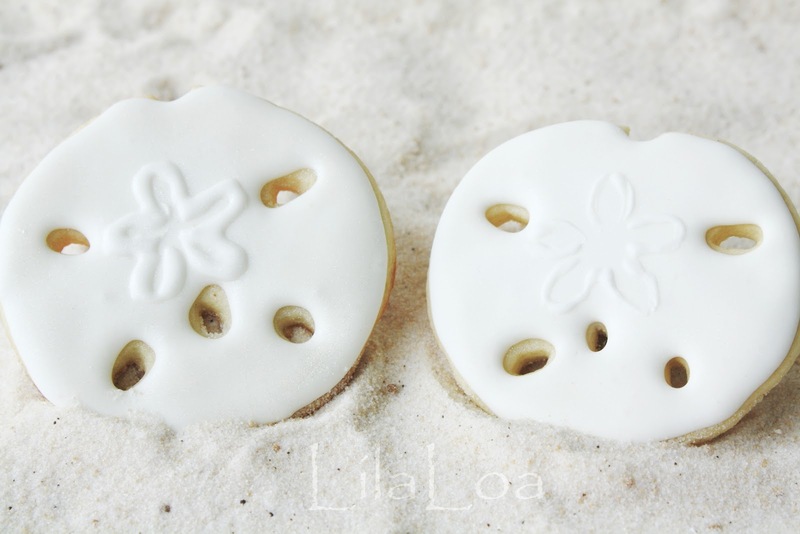 Did you know that those holes are called pores? Yeah....not in my cookie they're not. That totally grosses me out. 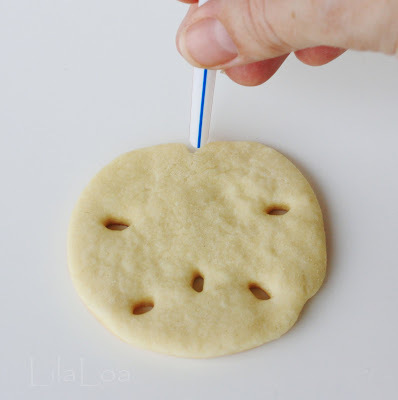 And don't forget to cut out a notch on the top. 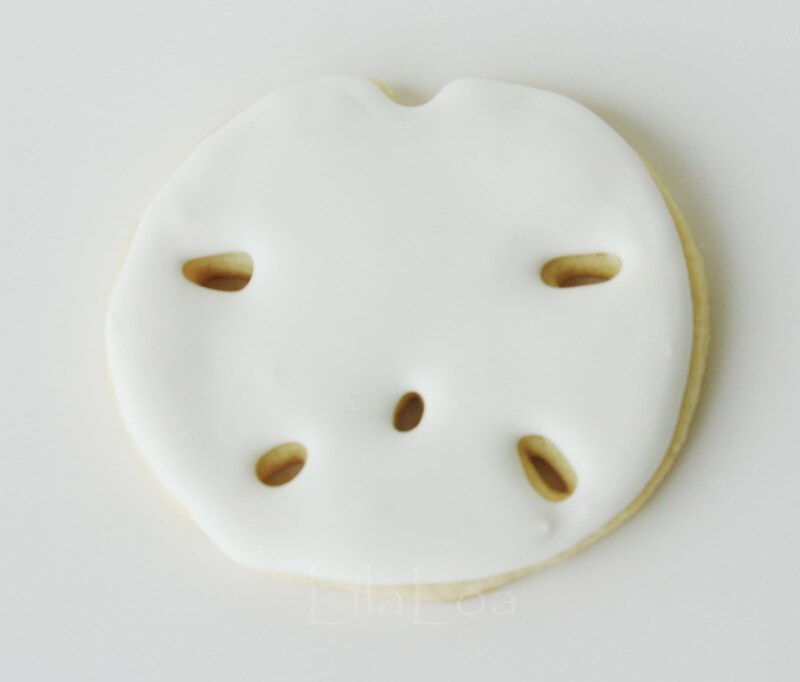 That's the detail that makes or breaks this cookie. Seriously...without that you all would have been wondering why I was making daisy frisbees with holes in them. Okay, maybe not...but I like doing it anyway. So then, you know, you ice the thing and let it dry. 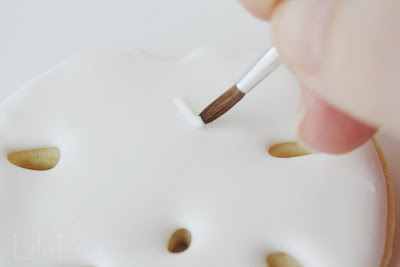 When you are icing the top, if you use one consistency icing, make sure you actually don't get too close to the holes. The icing moves a bit and will get itself a lot closer than you originally intended it too. 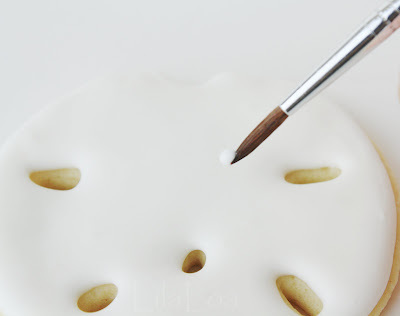 Just take a dab of icing on the end of a food grade paint brush and then paint one side of a petal. Get a new dab. Repeat. Over and over. And over. I love that it doesn't have to be perfect or even or anything. You know, because nature is rarely perfect. Whew. I think I need to go take a nap after this post. Good luck with your cookies.